Swim tracking is where Series 2 shines. It doesn’t look like it, but the “Series 2” version of the Apple Watch is all new. Apple crammed a ton of new health and fitness features to go along with heart rate–tracking and step counting into its second-generation wearable — including GPS, swim tracking, built-in meditation, and a collaboration with Nike. After a week of reviewing the Apple Watch Series 2, I think this $369 mini computer is worth its price for athletes, but maybe not so much for everyone else. Nothing makes me feel more alone in this world than when I’m mid-conversation with a person looking down at their Apple Watch while nodding to indicate they’re still listening. Presumably they’re just “taking a glance” at their daily step goal progress or a nonurgent text. But a glance can feel like a goddamn eternity when whatever is happening on someone’s wrist is infinitely more interesting than you. All this is to say that I was largely in the camp that smartwatches of any kind — not just Apple Watches — turn the people I love into insufferable assholes. Fitness trackers are uglier and dumber, but are less annoying somehow. It’s not like anyone’s trying to read the news on their Fitbit. But this new Apple Watch might have changed my mind about all that. It’s .9 mm thicker than the original, but I haven’t noticed it at all — and this time around, my experience was generally more enjoyable. That was thanks to three *crucial* under-the-hood tweaks that made this version feel more useful, and more like an actual watch. * “Raise to wake” works much better now (perhaps thanks to a 50% faster processor) so you can actually tell the time when you raise your arm (fancy that) — something that wasn’t always true in the previous version. * The screen is brighter, so you can actually SEE the time when you’re outside. * Finally, it’s water-resistant, so you don’t have to worry about taking this precious little computer off every time you want to take a quick shower or give your dogs a bath. Plus, Series 2 has more features that stand on their own and don’t require connecting to your screen jail — I mean, smartphone. I didn’t constantly feel like I needed to pull out the iPhone from my backpack. The swim tracking feature couldn’t have come at a better time for me. I’m training for a triathlon and have tried many swimproof trackers, including the Misfit Speedo Shine and Garmin’s Vivoactive, but quickly became frustrated by their clunky interface or utter lack of one. Do you know how boring long-distance swimming is? SO BORING. It means logging a lot of time in the pool, with only whatever terrible song is stuck in your head to accompany you, trying to keep track of laps. The Apple Watch now has a “Pool Swim” category in the Workout app. When initiated, the watch goes into “water mode,” which locks the screen (because it might otherwise respond to water drops). 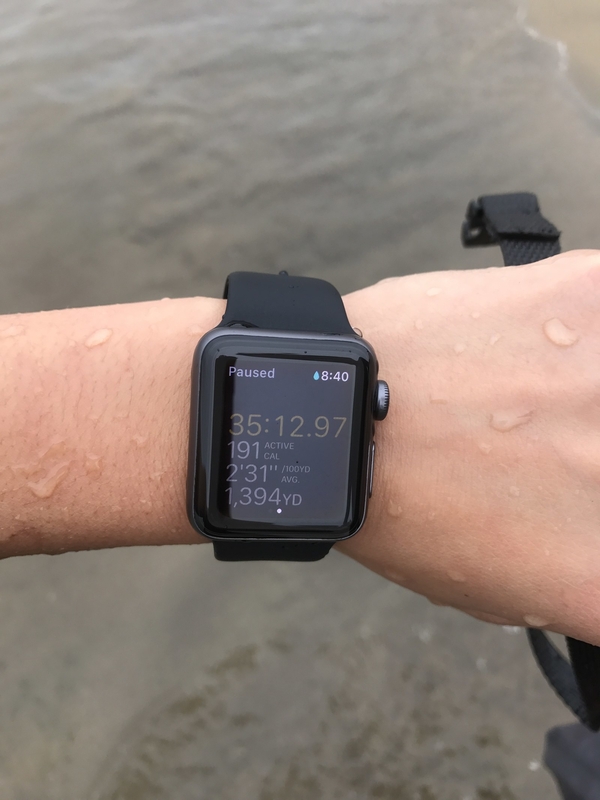 Once you begin swimming, the watch app can detect your stroke (different strokes burn different calorie amounts), average pace, distance, and number of laps. I alternated between flip turns and touch-and-go’s — and the watch counted laps correctly for both transitions. Lap counting and distance are a BLESSING and, if you are constantly trying to do pool math, you know it. Exercise makes math hard. The app also measures split times for every 100 yards and average heart rate, though I doubt it’s as accurate as an above-water reading. But the beauty of all this information was that I could view it incredibly clearly, while I was swimming, on an exceptionally bright display. I’m often swimming so long that I completely check out, and being able to see how far I have left to go tells me to either pace myself or push it. 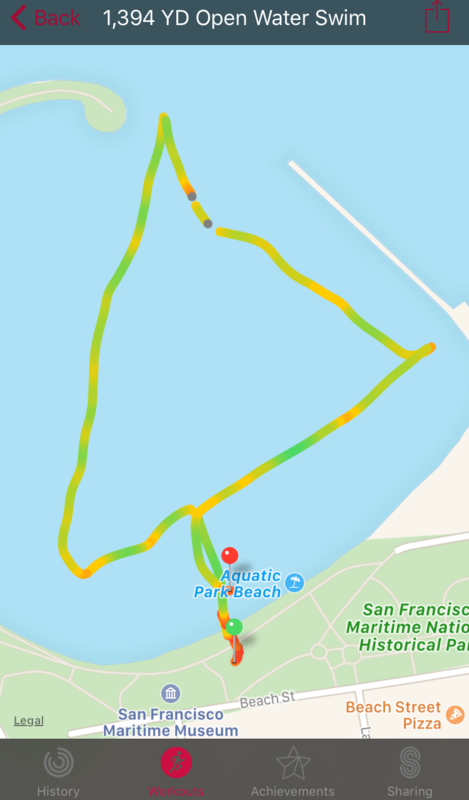 I don’t train in open water frequently (the San Francisco Bay is very, very cold) — but when I did, it was pretty fascinating to see the GPS map of my route. The display, tracking, and GPS provide a LOT of added value for swimmers — and even surfers, who can check tides and the time when they’re idling on their boards. But even if you aren’t a swimmer, the waterproofing (rated up to 50 meters deep) could come in handy if you want to get email notifications in the shower (or you could just bathe with the new iPhones). It’s nice not having to worry if you're just at the beach or hanging by the pool. Ultimately, though, it’s a marginal benefit for nonswimmers. There’s one thing I have to mention here that is so hilariously cool I laugh every time I think of it. The Apple Watch has a speaker that I’ve only ever used once, when I accidentally picked up a call in the middle of a meeting. But that speaker also expels water. Once you’re finished with your water activities, you need to take the watch out of water mode. Turning the Digital Crown (the iPod click wheel of our time) ejects water out of the speaker compartment, because it can’t emit sound when it’s wet. The speaker plays a little high-frequency tune and, if you look at the speaker grill, you’ll see a droplet or two ooze out. It’s SO FUNNY to me, probably because I’m a teenage boy underneath all of this Madewell denim. Good enough for slow marathon runners. Built-in GPS is another obvious game-changer for outdoor runners, cyclists, hikers, and lawn mowers, who can more accurately track distance, pace, and speed without being tethered to their phones. With the ViewRanger app, you can also download maps of national parks you’re visiting that show you trails, even without cell service. A huge problem with GPS is battery drain, and Apple claims its mapping features are good enough for a slow marathon runner (about five hours or so). I didn’t test this, because, sorry, no. This weekend, I really didn’t feel like running a marathon or biking for half of an entire day. If you don’t use GPS features, you’re likely to see pretty significant battery gains with the watch. Unlike GPS watches like Fitbit’s Surge, I didn’t have to wait for satellites to find my position before starting a workout. The watch uses local data, plus GPS and Wi-Fi, to detect where I am. I was able to initiate my runs and morning commutes fairly easily. I really enjoyed using the Workout app, but one of my favorite Strava features is being to use a previous ride to guide a new route and I can’t sync the GPS data from the Workout app back to Strava. Even if Strava wanted to implement this, it couldn’t (it’s not allowed by the API). So now I feel like my activity is spread across two different apps and that makes me very sad. Hopefully Strava will decide to update its app to take advantage of the watch's built-in GPS. GPS by itself isn’t extraordinary — but it does give Apple Watch users an actual reason to sync music they own (music you own! lol!). This feature isn't new, but many users may not realize they can load tunes onto the watch and listen via Bluetooth headphones like Apple's own $159 wireless AirPods earbuds (my first impressions of them here). This could be a game changer for joggers and gym rats, who can now truly leave their phones behind. But there are a lot of issues with Apple Watch's music app. First of all, you need to have actual music files stored on your iPhone (the watch will automatically download recently purchased music). But plenty of customers Apple is trying to reach rely on streaming services to access music. Second of all, Spotify, the dominant music streaming service, does not have an app that allows you to sync music marked for offline listening to your Apple Watch. So if you want Spotify tunes, you’ll still need to take your phone with you. A warm welcome for watchOS 3. * Navigation in watchOS 3 is much, much easier. When you press the side button, you can scroll through all of your favorite watch apps in a new dock. It’s so much better than trying to use the bizarrely designed app universe, which breaks my eyes every time I look it. My editor John says they look like salmon eggs and now I can't unsee it. * The new Workout app makes initiating exercise faster. It’s disappointing that the Apple Watch can’t auto-track your exercise (unlike most Fitbit devices and Samsung’s GearFit 2). * Activity sharing is fun, but the activity rings are still a little too abstract for motivation purposes. 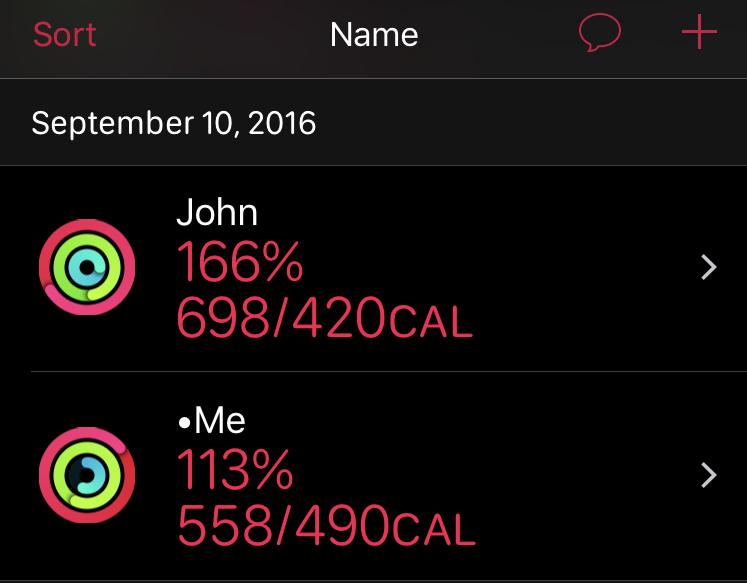 You can taunt or cheer on your activity mates, which is essentially a link to iMessage with some pre-loaded material (like “Nailed it!”). 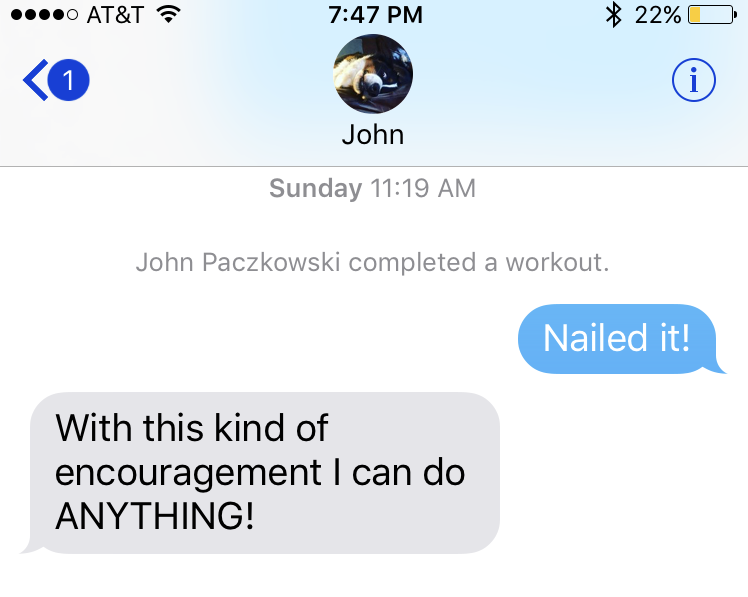 What’s most motivating (or demotivating, depending on how you look at it) is that your friends get a notification that you “completed a workout” every time. What’s strange, though, is you get zero details of what that workout actually was. It doesn’t matter if you walked upstairs or ran 100 miles. Emergency calling (by long-pressing the side button) is AWESOME in theory, and I’m thankful I haven’t needed to use it yet. The Breathe app is...interesting and, while the collapsing flower animation is mesmerizing, it has yet to make me feel more chill, especially because I’m getting nudged a bunch of times by a metal vibrating wrist thing and staring at an intensely vivid screen. OH MY GOD, THE NEW ANIMATED JELLYFISH WATCHFACE. Each time you raise your wrist, you get a different, breathtaking jelly (there are four) and it’s my favorite new thing about OS 3, tbh. Jellyfish > Breathe. Apple's new watch is faster, more water-resistant, and more fitness-friendly than ever. The Series 2 is definitely an improvement over the original Apple Watch — but, in my opinion, it’s only worth the $369 if you’re an athlete (especially if you’re a swimmer) who’s really going to take advantage of the new features. And if you live an ~active lifestyle~ you’ve probably considered every tracker under the sun. If you’re looking specifically for fitness gadgetry, consult this guide first. Having tried a lot of them (except for Fitbit’s upcoming water-friendly Flex 2), I will say that this Apple Watch has the best swim tracking interface I’ve seen — and swimmers, triathletes, and surfers should seriously consider getting this watch. But it doesn’t have auto-exercise tracking capabilities found on other devices, and routes tracked with the Workout app can’t be synced with third-party apps like Strava and MapMyRun. And in the end, the Apple Watch Series 2 still has all the pitfalls of being a smartwatch (namely its daylong battery life and bulk, compared to something more lightweight like Fitbit's Flex or Jawbone's Up). I haven’t tried the special Nike+ version of the Apple Watch, which may be the running device to end all running devices. The current version of the Nike+ Run Club app, however, has a disappointing 2.5 star rating because of its confusing layout and stats visualizations, so let's hope an update is on its way soon. If you’re a Netflix bum who wants emails on your wrist because you’re too lazy to pull out your phone, get the original Apple Watch, which is more “affordable” (but still expensive af) at $269 and now ships with the same processor as the Series 2. The Apple Watch Series 2 (available Sept. 16) and the Apple Watch Nike+ (available late October) start at $369 for select Sport and Nylon bands. The new Apple Watch Hermès starts at $1,149, and the new Apple Watch Edition, which now has a smooth, ceramic casing, starts at $1,249. You can preorder the watches at Apple.com.